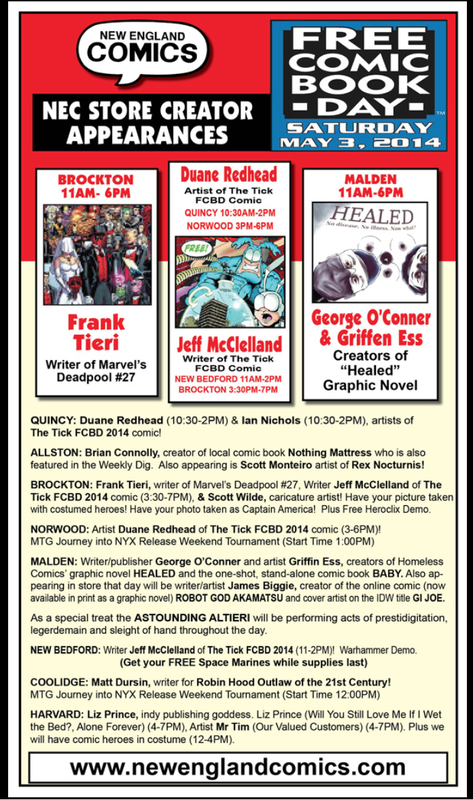 The latest installment of Free Comic Book Day takes place this weekend, and similar to last year, I'll be spending some time in Boston for the event signing copies of The Tick FCBD Special (and whatever anyone else brings to me). This year's event brings with it an extra treat, as artist Duane Redhead will be flying over from England to join me in Boston. Duane and I have worked together for the past seven years, but this will be the first time I'm able to meet him in person, so I'm very excited about getting the chance to finally annoy him in person and not just online. Duane and I will be at various NEC locations on both Saturday and Sunday. 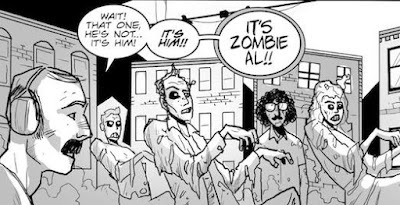 Ian Chase Nichols, who drew a short backup story in the FCBD Tick issue, will also be attending, so there's an opportunity for New England Comics store-goers to get the book autographed by the whole team. I had a lot of fun last year and this year is shaping up to be even better. If you're reading this and you'd like an autographed copy of the book (but you're not in the area to get on in person), leave me a comment and I'll try to make it happen. A few weeks ago, I took a trip to Pittsburgh Comics and flipped through a few boxes of comics priced at a quarter each. Any time I find a sale of this proportion I have expectations to find a particular type of book: 1990s Image, X-Force with a hologram stamp, Ravage 2099 #1 or various Return of Superman titles. Even so, I usually find one or two books that I add to my collection. This time was no different, as titles like Cyberforce and Supreme proliferated and the extra-sized, bagged Adventures of Superman #500 probably took up 10% of one box. In between a few books, I found the item pictured above: a "Superman Tribute Edition" of Wizard Magazine. First off, I love the generic male silhouettes. It's obvious that the company either had no right to use any of the Superman imagery, or they didn't have any artwork on hand. Other than the company logo at bottom, this is surprisingly the only imagery used in an otherwise incredibly text heavy ad, promoting both the upcoming Adventures of Superman #500 and the issues that follow, each featuring a different character who JUST might be a resurrected/reincarnated/cloned Superman. Interest in these issues stemmed from the incredible response to the Death of Superman storyline, culminating in the (literally) millions of buyers of Superman #75. The next big stop on the train was Adventures of Superman #500, which followed Superman's funeral and a very brief publishing hiatus. So let's say that you wanted to purchase a copy of the upcoming 500th issue of the title that used to be just "Superman" (a big deal regardless of the circumstances), but you wanted to get a deluxe version, one signed by all of the creators of the historic Death/Return of Superman storyline. That would only set you back...SIXTY BUCKS. Plus shipping and handling! ...A HUNDRED DOLLARS MORE. Incredible. I can't help but think that DF made money hand over fist on this deal. Maybe they took some of that money and invested in wisely, because if they sold out of this offer (what a world we'd live in if that's actually the case), they would have made (gross, I realize) over 1.5 million dollars, with another 600 grand coming in from the AoS #500 offer. Perhaps some of this money is still keeping the company afloat to this day. I'd be curious to hear if anyone actually went in on this offer. Happy birthday, me! Why thanks, Blogger, I really appreciate it. How did you know? Why, it's simple: at this time every year, I post pictures of some of the cool things that I get, and I make some half-hearted joke about how incredibly old I am getting. So why should this year be any different? Let's pull up a walker and take a peek at Jeff's birthday things! We start with the above picture of my requisite Dairy Queen birthday cake, adorned with green roses and the word "Pants". Classic! This will live on in the annals of great birthday cake sayings. Yes, it's a Franks and Beans reference, thanks for noticing. Amazon was a busy site/warehouse/depository/future site of human enslavement the week before my birthday, as many of my gifts were droned in from the company. First up on the list, the first two volumes of the early '90s Swamp Thing series! Apparently, the episode bundling went like this: season one - 13 episodes. Season two - 13 episodes. Season three - 50 episodes. Fifty! That's Hollywood for ya (I have no idea what that means). So with these two volumes, I picked up seasons one, two and half of season three. It should be fun to check this show out. Next on the list is the critically acclaimed "Heck" graphic novel from Tick alum Zander Cannon. I've heard nothing but great things about this since it hit the shelves a few months ago and I'm excited to check it out. I also got the latest collection of the slightly more well known Walking Dead. If you've only watched the show, don't stare at the cover too long. I finally got a Pirates shirt that I can wear outside of my house. It's a nice, soft shirt with that "distressed" look that is so popular these days. I credit the shirt with the Bucs' early 4-2 start. The next two items are gifts my wife (who has a birthday just a little while after mine) got, but I like them so much I'm including them on my own list. The first is the Blu-Ray collection of Firefly. Amazon had a huge sale on all Joss Whedon properties, so why not get a different version of a series you already own? We've got to prove, if to no one else other than ourselves, that the show is still popular and should be revived, BY ANY MEANS NECESSARY. Also included in my wife's gifts that I will use as if they were my own is this silicon Firefly ice cube tray! Just pour some water in and get mini, temporary replicas of Serenity. The detail on the ice cubes is really amazing, even if it doesn't come out in this picture as well as it could. The trays can also work for Jell-O molds or chocolate, which would be better if there weren't just six molds. I suppose that I could just buy three more of these...and maybe I will. Larry came over, great guy that he is, and blew my mind with this present - it's Optimal Optimus from Beast Wars! Because of events too embarrassing to recollect here, I missed out on my opportunity to buy this toy when it was first out in stores, and I've regretted it ever since. Larry was diligent enough to buy a figure that is complete, which is a big deal as many figures out there today are missing numerous parts. This is because Optimus's arm plates are made to fly off (battle damage) and he shoots clear missiles, both of which would be very easy to misplace in the 15 or so years since this figure was first produced and sold. Look how happy with this post-transformed figure! It was a challenge to figure it out but it was a lot of fun. If anyone on your (YOUR!) list has a birthday coming up, you could do worse than the items on this post. And of course, I'm happy to spend this next trip around the sun with you, faithful readers. Every damn one of you.